Monstachief with an 80’s flat deck with down angled rails and #jetstreamsurfboard caves and sluicebox inset doubles adding nitrous boosters and grip to a big guy ripper. Carbon reinforced tail for a’stompin’ …and a subtle little beak nose for style points. Specifically designed for guys in the 200 – 260lbs + range that want a versatile all-around board they can gouge away on…..in anything from 2 ft. sludge, to overhead throaters. Taken from the original monsta design, this board is armed with folkloric dimensions on a grand scale. For instance, the flagship of the line boasts 6’4″ x 21 1/2″ x 3 1/8″ with full, boxy rails; a 14″ wide nose and 17″ wide tail. Engineered to thunder down the line like a relentless freighttrain displacing buckets of biblical proportions. Don’t go longer to have the edge on the rest of the line-up….go stouter….THICK IS THE NEW THIN!! the HD | deep single to super deep single with inset double bonzeresque concaves through the fins, with single concave running off the tail block; “exhaust pipe”. Ideal for small scale to full throttle waves; incredible back foot control through on-rail full-speed cutties. MonstaChief -F (Flat rocker) | For flatter faced slopier waves that tend to lack power. A flatter, drivier rocker also featuring Todd’s new jetstream/ hydrofoilized hull concept. A favorite for surfer’s wanting a lot of smooth speed and lateral lift and exceptional hold through turns from their board. I use a flat deck with down rails in this model to put maximum foam and liters into the board while still keeping the rails sensitive and able to knife into the wave face, keeping them nice and responsive. 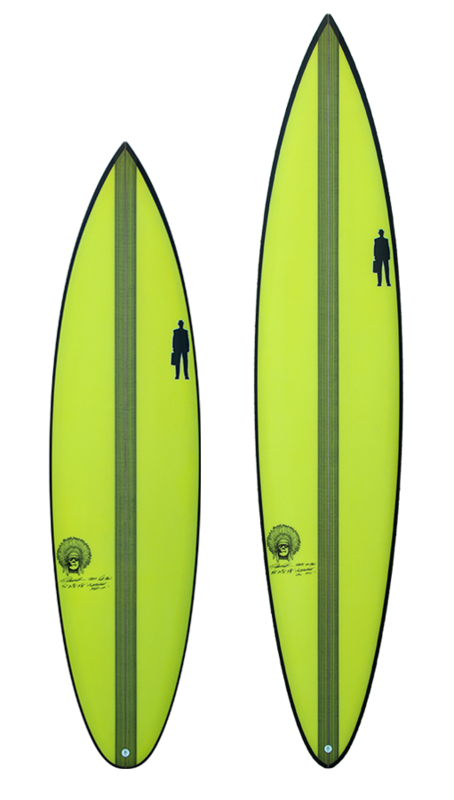 A very unique, futuristic new design of Todd’s that is transforming so many surfer’s experience in the water. Favors the wide squashtail for maximum lift in waves that lack energy.